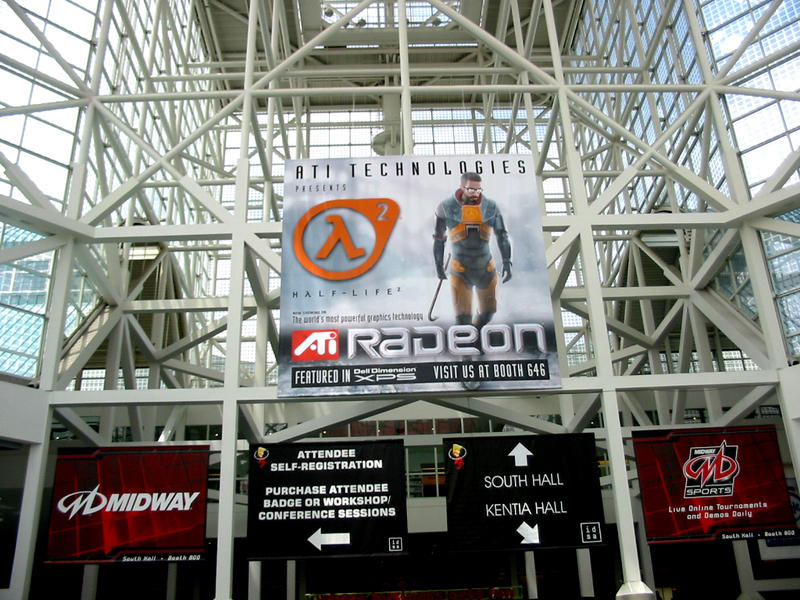 Next week is the 2017 Electronic Entertainment Expo (E3) and this week we'll take a look back at Next Generation magazine's recap of the 1999 show (Wednesday) and my time at the 2003 show (Friday). This year's show is actually open to the public for the first time. The tickets were a bit expensive but they did manage to sell out of all 15,000 that were available. I'm curious to see how that goes because as I'll mention on Friday, the show may not be exactly what the public expects and there's a good chance that the professionals attending for work will have a more difficult time getting hands on time, and thus the press coverage from the smaller outlets may suffer. Activision has already revealed Call of Duty: WWII and Destiny 2. Although Spyro appears in Skylanders, that series is taking the year off so I'm going to guess there will be something else with the character similar to the upcoming Crash Bandicoot N. Sane Trilogy. Also, it's not much of a secret but Call of Duty: Modern Warfare Remastered will almost certainly be getting a solo retail release ($49.99). That will probably be announced during the Sony press conference and release that day for PlayStation 4 and a month later for Xbox One and PC. Bethesda has a press conference and hinted at two new games, possibly original properties. Another Elder Scrolls must be in development but I don't know if Bethesda would want to overshadow the Switch release of Skyrim coming later this year so I could see the publisher waiting until next year for an unveiling of a new entry in the series. EA isn't technically at E3 anymore but it does set up its own thing nearby and holds a press conference. I'm not expecting much in the way of original properties here and it probably already announced just about everything ahead of time (FIFA 18, Madden 18, Star Wars: Battlefront II, Need for Speed Payback). Maybe there will be a trailer for the Star Wars game in development at EA's Motive studio but that's not a new announcement either. Is Dead Space 4 in development? That's been rumored on and off. EA Sports could return to boxing and although highly unlikely, I'd like to see another college football or MLB game. The Scorpio version of Xbox One will be the main event with Crackdown 3, Sea of Thieves, and State of Decay 2 being the primary games we know of. A reveal of Forza Motorsport 7 and Gears of War 5 seem likely as those are definite games at some point in the future. The Xbox One needs more exclusives and the old properties are wearing thin so I'll guess there will be at least one original game and one revival of an older property. Microsoft is the most difficult to predict as it is most in need of exclusives but doesn't have as large of a back catalog to draw from or as many in-house development studios as the other console makers have. Perhaps it will do another one of those deals like it did for Rise of the Tomb Raider or maybe purchase IO Interactive to acquire the Hitman series? Agent 47 would be right at home with Master Chief and Marcus Fenix, though the Xbox brand could use some characters with personality. Nintendo already announced a 2DS XL is coming in July, and we know the Switch is getting Splatoon 2 in July and Super Mario Odyssey before the end of the year. It might be too early for a Switch Smash Bros. but an announcement doesn't mean a game will be out this year or even next. If Nintendo announces a new Metroid will it be for Switch or 3DS? Although the 2DS XL isn't new in the sense that it is part of the same family as all of the other 3DS and 2DS handhelds, Nintendo may want a new game to help push sales of the 2DS XL. Sony has quite a few games in development that were announced at the 2016 E3 or earlier that are still a ways off (Gran Turismo Sport, Spider-Man, Days Gone, God of War, The Last of Us 2, Death Stranding, Detroit, Wild). Plus Uncharted: The Lost Legacy and Everybody's Golf will be out in a couple months. Could Sony really be working on more than that? Sony probably has at least a couple titles in development for PlayStation VR and something for PlayStation 4 (PS4). It really doesn't need anything else immediately for PS4 though, with the aforementioned games and the strong support the platform receives from third-party Japanese companies. Assassin's Creed took last year off and there have been some leaks about the next one being in Egypt so I won't predict that since it's about as official as it can be without actually being officially unveiled. We also already know about Just Dance 2018, The Crew 2, Far Cry 5, and a Rabbids + Mario Switch game. Here are a few other random guesses from the publishers I didn't get to: LEGO Star Wars: The Last Jedi, Borderlands 3, Tomb Raider 3, and the next Game of Thrones from Telltale. What I want to see is for Sega to announce Shenmue I & II HD remasters for PC. I'm not someone that typically plays remasters but I need to replay Shenmue before the third game (which is probably a long ways off) and in the U.S. we never got the first two on the same platform so it would be nice to replay them with the ability to play the sequel using the first game's save file. 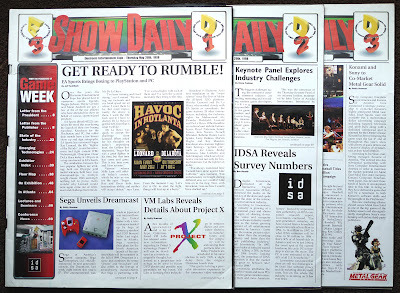 This article really needs more images so here is a photo of the 1998 show's daily magazines. At every E3 there is a show daily handed out to attendees each of the three days; they used to be over-sized but more recently they've shrunk closer to a standard magazine. The streams can typically be found on YouTube, Twitch, and many of the major video game media websites. EA just completed its conference and it wasn't very good. Aside from the games we knew about, it showed a new co-op only title called A Way Out and a teaser for BioWare's new property Anthem, that had previously been known by the codename Project Dylan. I thought EA had said they wouldn't show the new BioWare game yet, though I could have heard wrong. I'm glad to see it and the brief trailer indicated more would be shown during Microsoft's conference. Unfortunately, there was no mention of the EA Motive Star Wars game. Microsoft's press conference just ended and it was fine but no new properties and Forza Motorsport 7 was the only AAA exclusive shown that we didn't know about (though it was certainly expected). The Xbox One X looks nice and the third-party games shown also look good. There were plenty of world premieres and first on Xbox indie titles shown as well. However, I still think Microsoft needs more original exclusives. Maybe I should have just done a summary post instead of all of these comments. In any case, my predictions didn't work out too well as far as the press conferences go as those have now concluded. I'm giving myself a 4/13 on predictions and 2/8 on long shots. Microsoft did have Age of Empires news during the PC show but it wasn't a new one, instead it's a remaster of the original game. There was a hint about a possible new Age of Empires that will be unveiled at a later date. Also Bethesda did unveil the next Wolfenstein as expected. Sony showed quite a few VR games and Bravo Squad looks like a shooter so I called that easy one correctly. I didn't like Sony's conference too much though as it was primarily a bunch of trailers that could just as easily have been dropped on YouTube. The point of a press conference is to talk about the games but there was very little interaction with the audience. Quite a few games that we've known about for a year or more weren't even shown at all. Nintendo has some new games in the works from a few of its familiar franchises, including Yoshi, Kirby, Pokemon, and Metroid. Nothing was shown for Metroid or Pokemon but they are both for the Switch. In fact, the whole presentation was about games for Switch but some 3DS/2DS games were shown later and a Metroid 3DS game was one of them (it's a remake though, of Metroid II for Game Boy). Ubisoft had a good press conference. It didn't have a presenter this year, instead the CEO and the people that worked on the games kept things moving. Miyamoto was there too for the Mario + Rabbids game. Ubisoft revealed a few original games as well; one being a pirates game designed by the Singapore team that worked on Assassin's Creed IV's ship combat. While Activision didn't announce it at E3 as I predicted, the Spryo trilogy remaster is now a reality. And Sega finally announced Shenmue I & II are coming out this year!